Form 3749 is a Michigan Department of Treasury form also known as the "Form 402-xd - Importer Schedule Of Disbursements". The latest edition of the form was released in August 1, 2008 and is available for digital filing. Download a fillable PDF version of the Form 3749 down below or find it on Michigan Department of Treasury Forms website. This form is issued under authority of P.A. 403 of 2000, as amended. Filing is mandatory. Schedule Types: Check the appropriate box. Do not combine schedule or product types. Schedule Types - Check the appropriate box on page 1. Gallons of taxable fuel removed, sold or imported. 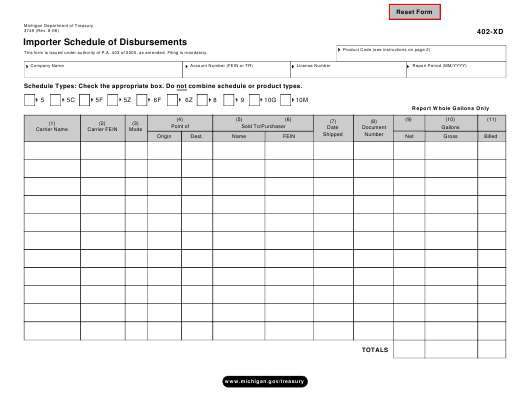 Do not include gallons reported on other disbursement schedules. Gallons of Aviation Fuel sold to Aviation Fuel Registrants for resale. Gallons of dyed diesel fuel sold/used for taxable purposes, Michigan tax collected/due. Gallons sold for Racing Fuel - Michigan tax collected. Gallons of dyed diesel fuel sold or removed for tax-exempt purposes. Gallons sold for racing fuel - Michigan tax not collected. Gallons sold tax-free to U.S. government. Gallons sold tax-free to state and/or local government. Gasoline and diesel fuels only. Gallons of gasoline sold tax-free to feedstock users. Carrier - Enter the name and Federal ID Number (FEIN or TR) of the company that transports the product. Point of Origin/Destination - Enter the location the product was transported from/to. Sold to/Purchaser - Enter the name and FEIN of the company the product was sold to. Date Shipped - Enter the date the product was shipped. Enter the bill of lading, manifest or other loading document number. Net Gallons - Enter the net amount of gallons disbursed. Gross Gallons - Enter the gross amount of gallons disbursed. Billed Gallons - Enter the number of gallons to be billed to the customer.